Simply as an addendum to the previous post – to look, in fairness, not only at how Pakistan (and that ‘North West’ in particular) is mapped in the outsider’s media narrative, but how that may looks the other way around. Conversing with Pakistani craftsmen, drivers, soldiers and cooks from the Pashto speaking parts of Pakistan during work, I was interested where exactly they hailed from. ‘Peshawar’ was often the simple answer – for one, because it is assumed that ‘Dir’, ‘Charsadda’ or ‘Batkhela’ wouldn’t really tell me much, but often ‘Peshawar’ was really what they meant to say. A certain perimeter around the city (and I am not sure to what extent and how that changes for different people, for some native Bajaur or Kohat would still be ‘Peshawar’, other really only took it to Hayatabad) is regarded as justifyably referred to with this urban summary. I don’t know Peshawar and it’s surroundings well enough to make further statements on this, however I never met a person from Okara, Nankana Sahib or Muridke for that matter who would say he or she was from Lahore. More interestingly is the notion however of the space that lies beyond the city. Not only for our driver during work in Kashmir whom we knew very well and he equally knew and understood us, was I coming from a place ‘Peshawarse pichai‘ [from behind/beyond Peshawar]. And there it really did not matter whether that was Mashad, Innsbruck, or New York [I am not sure whether this ‘beyondness’ extends over the Pacific, I assume Beijing or Tokyo would be rather considered this side of the Khyber Pass]. In any case, this may be an indication, of how the native space is regarded by some people from the area (this is an observation limited to a certain stratum of society). 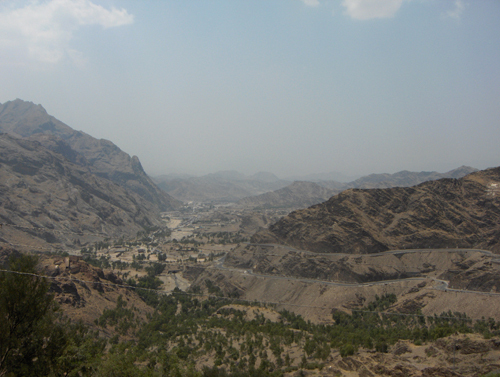 ‘Peshawarse pichai’, seen from the Khyber Pass in 2006. Above, the view from the Khyber into the lands beyond. Beyond this place is also that remote place of Montana, where a court recently ruled in the Greg Mortenson case. What should be considered more important after this story than just paying back huge frauded debts, is the realization that the space we are talking about (be it in the drone debate or the aid debate) is very often misrepresented. And it unfortunately often remains so from both sides of these disputes.